In their early period Siebe, Gorman & Co. manufactured rebreathers which were entirely based on the concept of Henry Fleus (another German scientist who had immigrated to England). The rebreather that Fleus developed comprised a rubber mask with a breathing loop and a filter. The circulation of the breathing mixture required the force of the human lungs to power it. 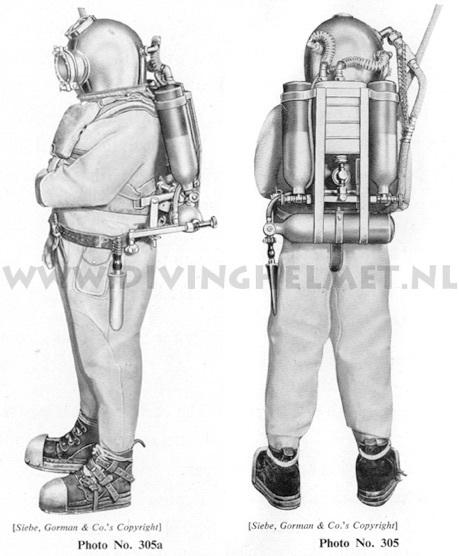 This system was further developed by Siebe, Gorman and was called the ‘Fleus-Davis’ rebreather (Robert H. Davis was the managing director of Siebe, Gorman at the time). In 1895 Bernhard Draeger invented the ‘injector’, which is a part for a rebreather system that creates a steady gas flow without the need the human lung force. In 1899 he further developed a ‘portable injector rebreather’ apparatus in cooperation with ‘Sauerstofffabrik Berlin’. This injector system has two advantages: it enables the diver to breathe freely in a space without the need of a mouthpiece. Secondly it does not require the need of the diver’s lungs to keep the circulation of the breathing gas pumping through the filter system. The invention was a huge success and Draeger sold large numbers of rebreathers around the world. As a result, in 1912 the rebreather systems were divided in two main categories: rebreathers that relied on human lung power alone to circulate the gas around the system (as used in England and France) and the ‘venturi’ system in which the gas is circulated by an ‘injector’ (as developed by Draegerwerk in Germany; also see chapter: ‘1911 Draegerwerk’). 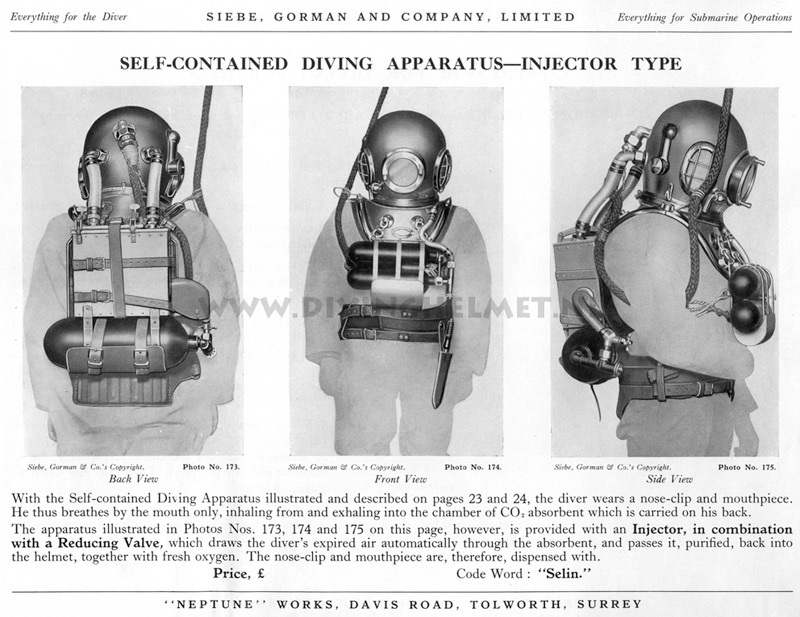 To compete with Draegerwerk, Robert Davis of Siebe, Gorman built the ‘Self Contained’ Diving Apparatus which was produced entirely from the findings provided by Henry Fleus and which had been used in the ‘Proto’ rebreather design. The diver was required to breathe through a mouthpiece and relied upon the force of the human lungs to pump the breathing gas through the filter. 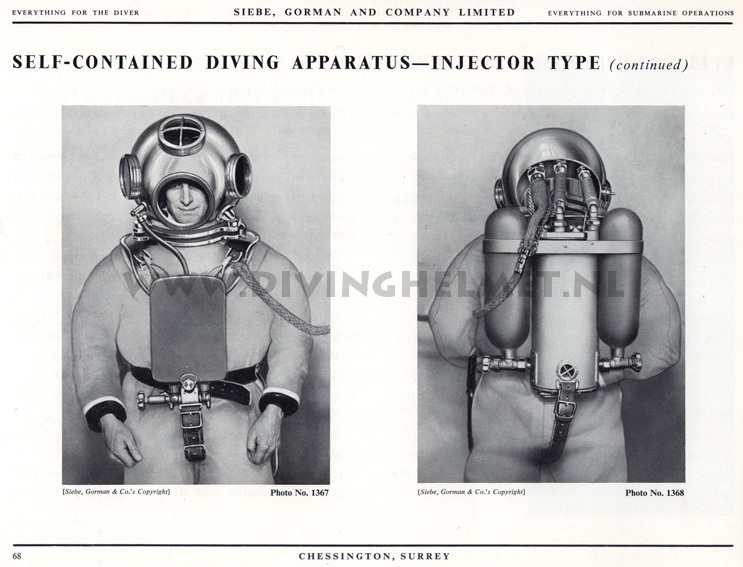 The ‘Davis Self Contained Diving Apparatus’ had been offered for sale by Siebe, Gorman & Co. Ltd’ for over 20 years but was not manufactured in any significant quantity. 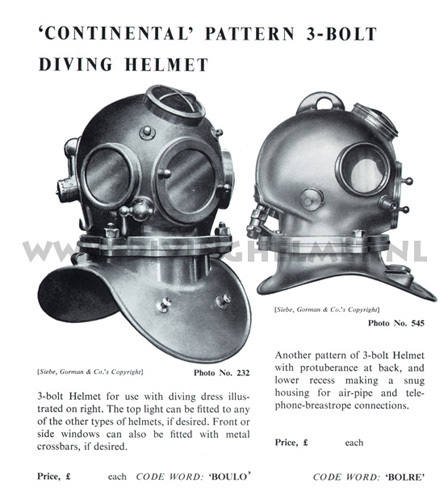 The ‘D5’ catalogues also depict an English copy of the Draeger ‘DM’ diving apparatus, but with the ‘Bubikopf’ helmet, which Draeger ceased making in 1942. The front weight with bail-out tanks were supplied in small quantity to the Dutch military during the 1950s to be used with the 6-bolt helmets, but I know of only one English ‘Bubikopf’ helmet that still survives today (the one which was once in the official Siebe, Gorman collection). It is probable that this apparatus type was not manufactured in any quantity, probably because Draegerwerk re-started manufacturing its diving apparatus soon after the war. I don’t know if it was because on the second of May 1945 the english second army occupied the german town Lübeck, the hometown of Draegerwerk. 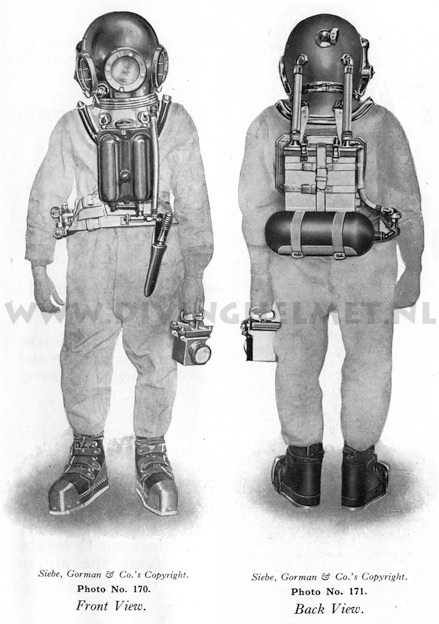 But after the second world war ended Siebe Gorman offered nearly exact copies of Draeger diving equipment in its ‘D5’ sales catalogs. In the 1935 edition of ‘Deep Diving and Submarine Operations’ (Siebe, Gorman’s company manual by Robert Davis) some new Siebe, Gorman ‘Deep Diving’ apparatus is illustrated for the first time: the ‘Injector Type Diving Apparatus’. However, by this time it already seemed clear that the Draeger system was far more suitable for use in combination with a diving helmet when compared to the English ‘Fleus-Davis’ system. The Draeger injector system was not only used in the Draeger DM20 and DM40 diving rebreathers but also in the American mix gas US Navy MK5 helmets and in post WW2 Russian rebreather helmets such as the ‘GKS3m’ and the ‘WKS57’ ( early 2012 the website HDiBANK.COM image bank will be opened you can check it then for US Navy and Russian diving equipment). The illustration above shows the ‘Self-Contained’ Diving Apparatus developed by Robert Davis based on the work of Henry Fleus. The diver has a mouthpiece and had to pump the breathing gas through the filter using the force of his lungs. 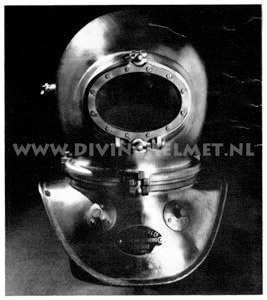 Above: the ‘Self-Contained’ Diving Apparatus as advertised in the Siebe, Gorman & Co Ltd sales catalogue of 1939. The rebreather was entirely based on the Draegerwerk system. 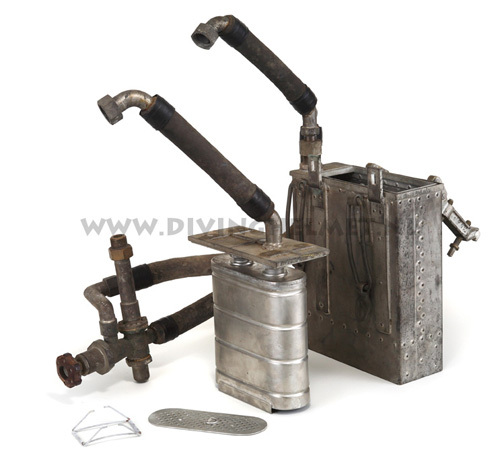 The image above shows the Siebe, Gorman ‘Mine Recovery Self-Contained’ Diving Apparatus’ (MRS) that was developed during WW2 to clear German acoustic and magnetic mines. The apparatus produces little noise due to its re-circulating system (e.g. no exhaust bubbles) and metal parts are made from low magnetic material. 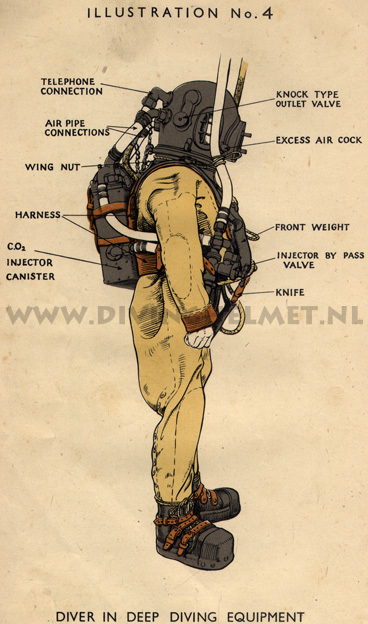 This Siebe, Gorman & Co. Ltd. rebreather apparatus appears to be the only type that was used by the Dutch navy. 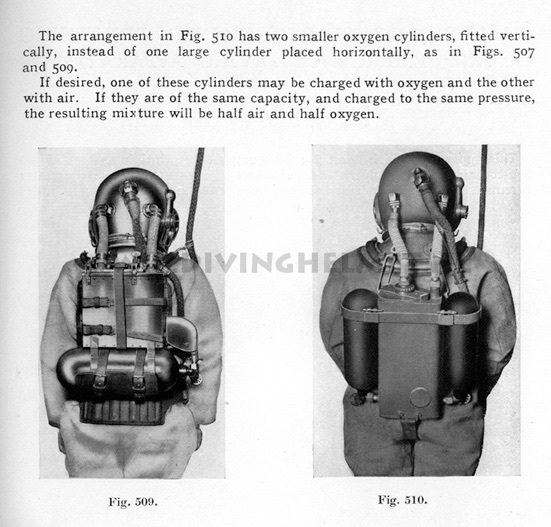 Below: page 155 of the 1935 edition of the Robert Davis ‘Deep Diving and Submarine Operations’ manual illustrates two versions of the of the Siebe, Gorman & Co. Ltd rebreather back-pack using the ‘Injector Type Self Contained Diving Apparatus’. The example on the right appears to be a direct copy of a Draeger ‘DM’ back-pack (shown in the color image on the far right; see chapter: ‘1911 Draegerwerk’). Photograph, David L.Dekker collection. The image above illustrates the Siebe, Gorman Deep Diving Apparatus purifying system. When descending and ascending the diver had to exhale through the mouthpiece to filter out the carbon dioxide from the breathing gas. Once on the bottom the injector would start up the ‘venturi’ and the diver would then drop the mouthpiece. Was Robert Davis still convinced of the dangers of using a 1912 injector in 1935 (especially after the Draeger injector system was adopted for deep diving helmets with the US Navy and others)? Had he ‘invented’ the injector himself? ... This deep diving apparatus was first shown as a sketch in the 1935 4th edition of ‘Deep Diving and Submarine Operations’ and this apparatus was still being illustrated in the 1969 (7th edition) manual (see illustration above). The ‘injector’ diving apparatus is absent from any Siebe, Gorman & Co. Ltd. sales catalogues, but the Siebe, Gorman & Co. Ltd. apparatus was illustrated and described in the Royal Navy Diving Manual B.R. 155/43 of 1943 ( see above scan). This type of helmet was not introduced until the 1960s and it was based on the ‘Mine Recovery Suit’ (MRS) of WW2 (shown above). From the time that Jacques Cousteau started the serial production of his ‘CG45’ regulator and HP SCUBA tanks the diving business started to change. Until then diving apparatus was only affordable by the larger diving and salvage companies as the apparatus was highly expensive and required skilled divers and attendants to operate it. However when Cousteau developed his regulators and dry-suits at a much lower price (for use with either SCUBA tanks or with surface air supply), underwater work could be accomplished more cost effectively by less skilled divers. This meant the end for several of the larger diving companies. The ‘Utility helmet’ was promoted by Siebe, Gorman & Co Ltd. as an ‘economical but efficient helmet’. The above image is scanned from the Siebe, Gorman ‘Marketing Data Sheet No. D1’. Unfortunately I have yet to find a ‘Utility’ Helmet, but as soon as I do, I will add some original photographs.